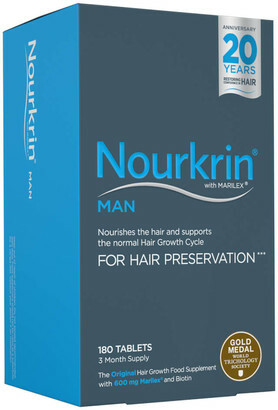 Discover a safe and drug-free approach to hair preservation with Nourkrin Man Starter Pack - 3 Month Supply; a daily supplement designed for men facing the prospect of hair loss and thinning. The tablets seek to support, normalise and maintain the natural hair growth cycle by providing the correct nutrients to the follicles. The supplements contain Nourkrinâ€™s exclusive ingredient MarilexÂ®, Acerole Cherry Extract and Fenugreek, which work in synergy to provide the scalp with an array of Vitamins, including Vitamin C, A, B1, B2 and B3. The addition of Cod Liver Oil Extract offers a dose of Vitamin A and D. Finished with D-Biotin, Nourkrin Man is able to contribute to the maintenance of normal hair. With continued use over a six month period, the supplements strive to restore the hair growth cycle to normal, which promotes strong and healthy hair growth, whilst discouraging thinning and loss.